I spent New Year’s Eve with some new friends who were so nice to invite me over. Their only request was that I bring an appetizer… Appetizers are like the most yummy foods out there. Of course, I’d be happy to bring one. I have a few ol’ stand-bys that are crowd pleasers, but I decided to branch out and try a new one from one of my favorite bloggers – Can You Stay for Dinner? I love ANYTHING buffalo. That spicy goodness… it’s just my favorite. 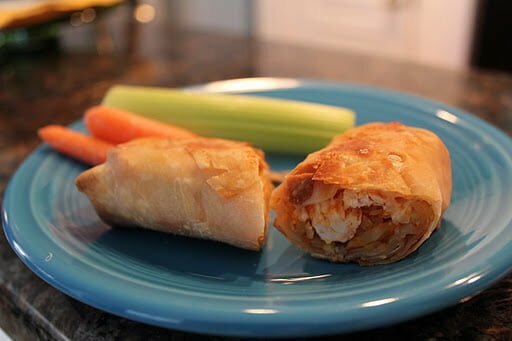 As a BONUS: Andie posted that these egg rolls only have 103 calories each!! PERFECT! It also gave me the opportunity to perfect my egg-rolling skills. 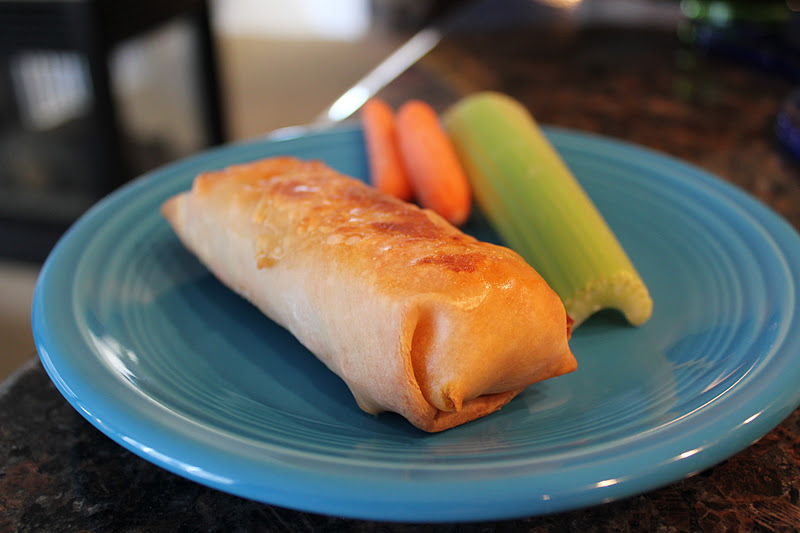 These were my first egg rolls ever… so easy! Before we get onto my healthy, yummy appetizer… I have to confess that I met a new dip at this party. Oh, I should never try new dips. I fall for them so quickly. This one was a BLT Dip, with no “L” and after I had enjoyed it for a while I found out that the secret ingredient was bacon grease??!! 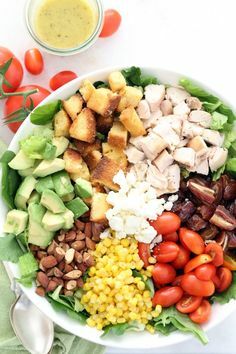 It was so tasty and worth every bite, worth every extra minute I spent at the gym yesterday morning – – Yum-O. 1. Preheat oven to 400 degrees. 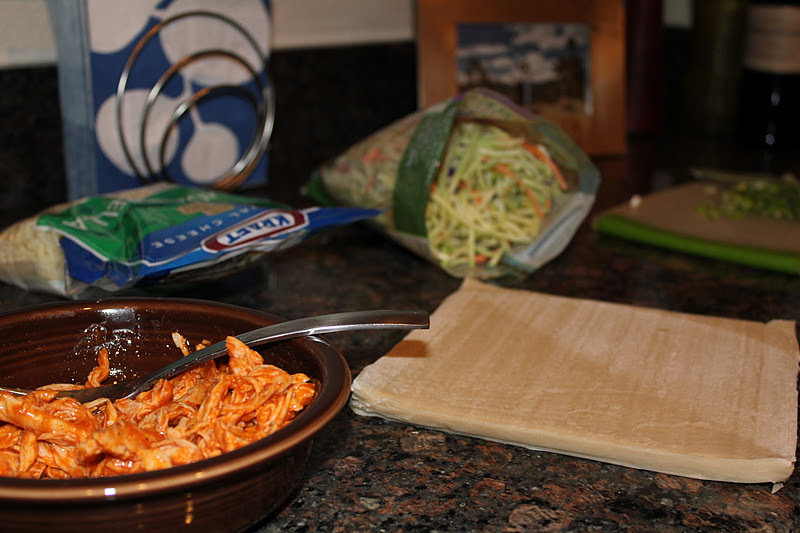 Lay egg roll wrappers on a clean work surface. In a small bowl, stir chicken and hot sauce until well coated, using more or less sauce depending on your spice preference. The meat should be moist with sauce. 2. 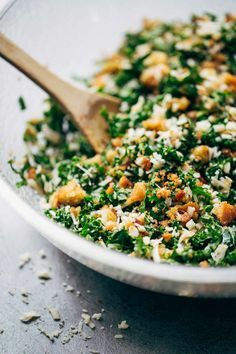 Begin by placing one tablespoon of the broccoli slaw on the diagonal of the bottom right corner of one of the wrappers. 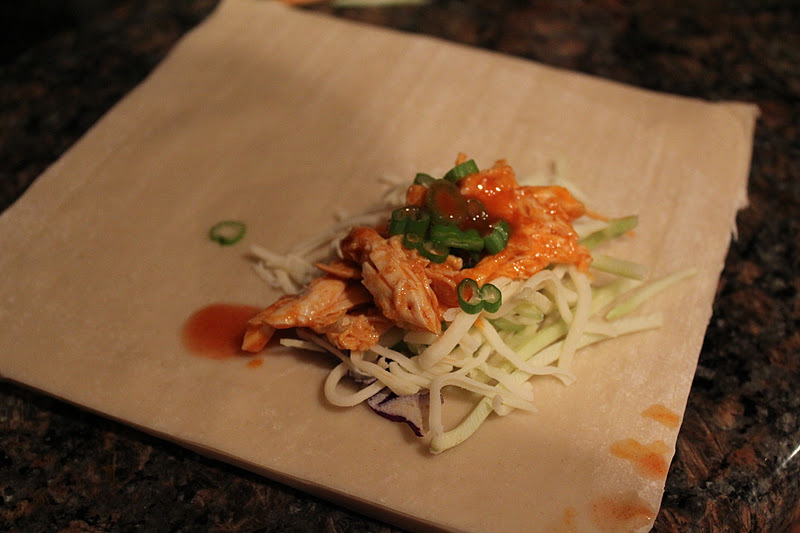 Next, place 2 tablespoons of shredded spicy chicken evenly on top of the slaw. Spoon 1 tablespoon of the cheese over the chicken. Add one extra splash of hot sauce and sprinkle with scallions. Be careful not to overfill. 3. 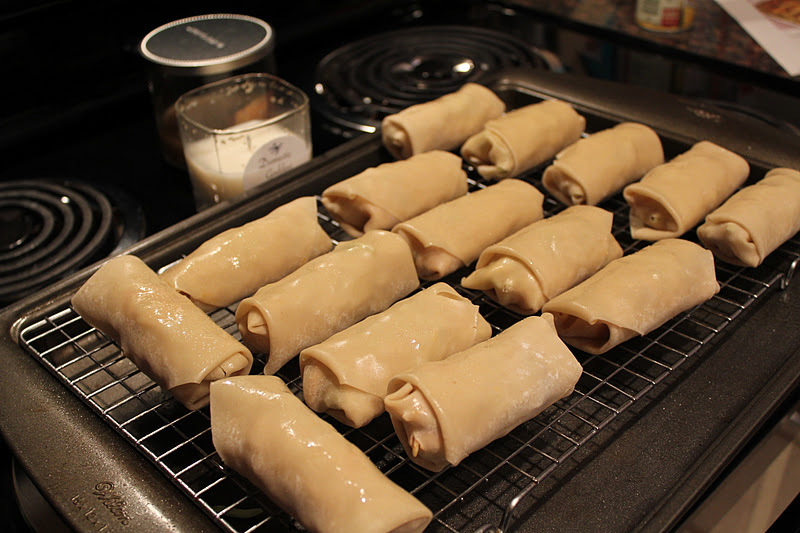 To fold: Fold the bottom right corner over the stuffing mixture so that it covers it completely, with the tip of the corner now pointing to the center of the egg roll wrapper. Fold in the bottom left corner, followed by the right, so that you now have formed an envelope. Roll the wrap upward one time, leaving the top left corner open. Wet your index finger in the small bowl of water and press to moisten the top left corner. Now fold that down on top of the filled roll, sealing it like you would an envelope. Repeat with remaining rolls. 4. Place the rolls on a greased cookie sheet coated with nonstick cooking spray. Spritz each roll evenly with nonstick cooking spray and sprinkle lightly with salt. Bake for 20 minutes (turning each roll over about 1/2 way through the process.) Bake until the rolls turn golden brown. using just the cookie sheet for crispier rolls. 5. Serve with Ranch or Blue Cheese Dressing as a dipping sauce. Garnish the tray with carrots and celery for something extra. Previous Post: « What’s on the Agenda for 2012?